"Calamitous presidents, faced with enormous difficulties -- Buchanan, Andrew Johnson, Hoover and now Bush -- have divided the nation, governed erratically and left the nation worse off. In each case, different factors contributed to the failure: disastrous domestic policies, foreign-policy blunders and military setbacks, executive misconduct, crises of credibility and public trust. Bush, however, is one of the rarities in presidential history: He has not only stumbled badly in every one of these key areas, he has also displayed a weakness common among the greatest presidential failures -- an unswerving adherence to a simplistic ideology that abjures deviation from dogma as heresy, thus preventing any pragmatic adjustment to changing realities. Repeatedly, Bush has undone himself, a failing revealed in each major area of presidential performance." FROM: Sean Wilentz "Worst President in History?" "The buying of such images intrigues me. What does it mean to have the political atrocities of our time hanging on the wall of a home or business or institution? Is this a way to keep the world's suffering close at hand - or to tame it? In the days since seeing theses shows I have tried, without success, to imagine the purchasers of these photographs, and their motives; I've tried to envision too, the places where they might hang the hacked up Rwandan, the unbearably light Serb Soldier and the Cambodian corpses." "Rice used her speech to defend the U.S. involvement in Iraq. While the U.S. had probably made ``thousands of tactical errors'' in Iraq and elsewhere, the Bush administration will be judged by its larger aims of peace and democracy in the Middle East, she said. ``If you're impervious to the lessons you've just come out of you're brain-dead,'' she told the gathering, organized by the Royal Institute of International Affairs, a U.K. foreign policy research center. ``I believe strongly it was the right strategic decision'' to invade Iraq." Well, the Secretary rightly has taken significant criticism for that particular claim. If you are interested in learning about just how the indefensible "strategic decision" to invade Iraq has created mayhem tactically for American military operations there, I highly recommend George Packer "Letter From Iraq: The Lesson of Tal Afar," The New Yorker (10 April 06). There also is an on-line slideshow of images by Samantha Appleton. The lesson? The ideological blindness, incompetence and duplicity of the Bush Administration has quite simply hung American servicemen and servicewomen out to dry. PS: When I wrote the initial post I forgot to include one thing - the administration has left the Iraqis - to whom they are promising "peace and democracy" - out to dry as well. This seemed perhaps too obvious to need saying. 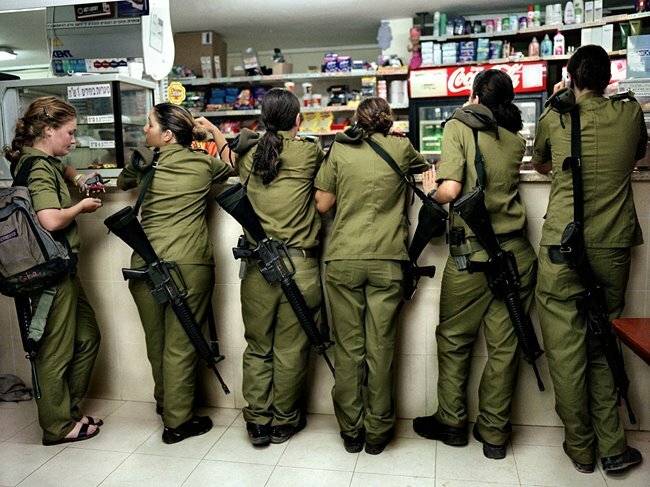 Rachel Papo, a young Israeli-American photographer, has produced a thought-provoking photo essay entitled Serial No. 3817 131 which focuses on young women doing their compulsory military service in the Israeli army. Many of the images present their military life as mundane and uninteresting. And you can imagine similar, more traditional shots of "solidiers" that would be themselves almost wholly uninteresting. 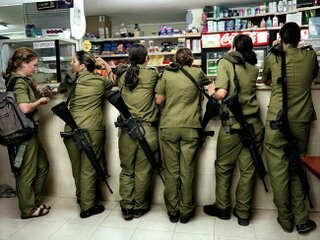 Papo's pictures, however, attract our attention in part becuase these are girls posing nonchalantly in uniform with their automatic weapons. This raises questions of commitment (patriotism) and equality. I have two teenage sons and I fear that the continuation of BushCo policies will land them directly in the line of fire in the name of yet another ill-conceived and/or duplicitous policy. On the other hand my sons and I and people like us are the beneficiaries of the poverty draft that populates the US armed services with kids who are overwhelmingly working class and poor and disproportionately minority. I regularly ask the often stridently pro-war students in my freshman classes why they are here taking courses at the University when their conviction ought to have them off fighting. So, should we insititute a draft (without loopholes) or mandatory service? Most Americans, even the most bellicose I'd wager, would balk at the idea that they actually owe anything to their country, that they have an affirmative duty to perform national (not necessarily military) service. They surely don't think they should have to place their sons' lives on the line. And they would be positively aghast if you suggested that their daughters ought to take up arms in the name of homeland security. Perhaps that should be the measaure of our convictions? Papo's images raise still another obvious perplexity. Is it any sign of progress toward gender equality that we might come to expect our daughters too to learn to shoot and kill? Just because men can (and, in fact, do) do something, no matter how morally questionable is hardly a sufficient reason to encourage women to do it too. Seems like an awfully odd notion of progress. I am not a pacifist. But I also think the more or less unquestioning glorification of the military among Americans is pretty much reprehensible. By the way, I came across this work thanks to Ragna who keeps a quite interesting blog called Meet Me in Ataxia, Baby. I am going to be in Durham, NC in a couple of weeks and thought I would see what is going on at the Center for Documentary Studies. They recently have published a book of photos by Steven Smith entitled, The Weather and a Place to Live which I have not seen. Most intriguingly, the CDS websight referred to a piece by poet Robert Pinsky comparing Smith's images to South Park. That makes me curiosus! "Robert Pinsky, (former poet laureate; author, Jersey Rain) 2005 was the year I recognized a cultural force alien to me: a rebellious, defiant vitality rooted in the American suburban West. That may sound like a joke. It sounds paradoxical or absurd to me, an Easterner. Here are two examples, profoundly disparate, of what I mean, one from television and one from art photography: the animated series South Park and Steven B. Smith's collection of photographs, "The Weather and a Place to Live", winner of the 2005 Honickman Prize in photography. With each new season, the pre-adolescent characters in South Park, Col., enact more daring, unruly versions of reality. Those foul-mouthed yet innocent falsetto voices demolish cant from the left and the right. Mealy-mouthed moderation and evangelism, sanctimony secular as well as religious, get what they deserve, and the setting is a Western town a half-hour from Denver, a place where shopping mall culture and Main Street (site of "Tom's Rhinoplasty") thrive in co-existence. Even Hell and Heaven become part of the system with South Park Elementary School at the hub. Smith's black-and-white photographs share some visual qualities with the cartoon-colored townscape of the TV series: stark expanses where the monumental blankness of a Utah or Colorado sky meets the equally blank geometry of irrigation pipes or two-car garages. Between mountains and fences, between a tremendous rock face and giant stacks of plywood, Smith's images record not so much a contrast as two violent absences joining as a single force. Landfill, seedling, turnabout, heating coil collude with the sky and mountains in a triumph of disproportion: scale not so much confused or lost as irrelevant: a loss of footing that is a visual equivalent for the moral goofs and chasms of South Park. The deadpan, improvised juncture of immensity and triviality: that harsh, uninflected tone shared by these amazing works is different from my New Jersey ways and sensibilities. It is different from the language of poetry, too. (On the other hand, Smith's title does come from a poem, James McMichael's book-length meditation on Pasadena, "Four Good Things.") But like true poetry, they peel away my automatic responses, and invite me to look again." It sure would be nice to know what he thought he was talking about. This is the sort of statement that has, I think, rightly made political theorists suspicious of photography and photographers - as though some accumulation of facts will somehow amount to what we actually want and need - a causal story that accounts for or explains what it is the pictures are meant to convey. A short while ago I recieved notice that Blueeyes Magazine has reappeared follwoing a nearly year long hiatus. I posted a plug for the magazine early on. The highlight of the new issue, which is #11, is a very nice photoessay on the Caucasus by Toshiki Senoue. "Nature Photography of even less extreme scenes, but photography that acknowledges what is wrong, is admittedly sometimes hard to bear - it has to encompass our mistakes. Yet in the long run, it is important; in order to endure our age of apocalypse, we have to be reconciled not only to avalanche and hurricane, but to ourselves." The opening quotation is from Robert Adams' Beauty in Photography (Aperture 1981). Adams is a man of his word. 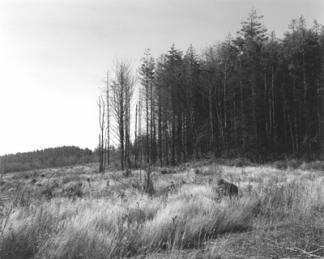 He recently won the 2006 Deutsche Borse Photography Prize for a series of photographs (including the one I have lifted here) focusing on de-forestation and environmental degradation in Oregon. He announced that he would donate the $52K award money to Human Rights Watch. Adams stated: "However concerned I am about the environment, I'm even more concerned at the moment with a collapse in human decency." Adams has done an extremely admirable thing. Make no mistake about that. And I do not want to seem overly critical, but the basic difficulty here is not simply a deficit of human decency. The source of most of the problems that Human Rights Watch and similar organizations address are political - the failure, whether due to inability or unwillingness, of political authorities and legal agencies to protect vulnerable populations from the powerful actors who prey upon them.